Every time we at Earth Mantra think we have found our favorite music by Kit Watkins, it seems that we find another contender for the throne. 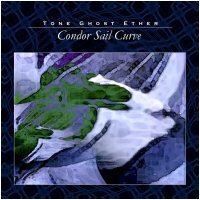 Such is our experience with the magnificent release Condor Sail Curve by Tone Ghost Ether. For those not familiar, Tone Ghost Ether is a three way collaboration between musical virtuosos Kit Watkins, Brad Allen, and John Tlusty. What is really special about this collaboration, besides the mastery each artist so obviously wields over their instruments, is the realtime improvisational approach to composition that they have employed in making their graceful and radiant music. Indeed, all of the music by Tone Ghost Ether was improvised and played in real-time without any overdubs. Minimal editing was sometimes performed after recording, but the nature of the immediacy of this music remains intact. The music of this particular release by Tone Ghost Ether is pure floating ambient bliss, very much in the vein of Kit's world class solo music but incorporating delicious new elements and directions by Brad and John. It was described by one reviewer as "A one-hour program of shimmering, haunting music that is at once captivating and relaxing. A perfect companion for meditation or sleep." We agree wholeheartedly, and we would add that anyone who enjoys ambient music should grab this exquisite album immediately.